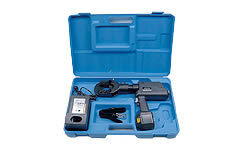 REC-S440 Battery Operated Tools: Izumi Products. The REC-S440 was designed to cut the ACSR cables used in transmission line work. I tis now equipped with rapid ram advance mechanism for faster operation. With the pull of the trigger, you can cut ACSR cables up to 38mm, guy wires to 20mm, wire ropes to 22mm and ground rod to 16mm. 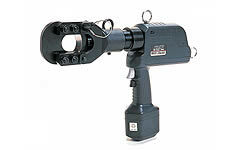 The rotating head provides exceptional ease of use and maneuverability in tight working quaters. The lock pin head type allows the cutter head to open wide for easy insertion of cutting material. The REC-S440 has an overload bypass which will kick out when the tool reaches 7 tons of output.